How a local Monterey cypress tree becomes a Hill Guitar! Guitar making is very much a lifelong love affair with wood. The 4-6 different woods that go into an individual guitar each has a different purpose and characteristics, and they come from all over the world. There is no one country or continent that supplies all of the materials that go into a traditional classical guitar. Traveling to the source and seeing the trees being harvested and turned into guitar materials can be very exciting, and offers a lot of insight into the character of wood and how valuable and hard won it is as a resource. I've been to some of those sources, but by no means all. I've never seen a rosewood tree or an ebony tree, maybe I still can someday. Here along the central coast of California there is one tree that is fairly common and useful for some types of guitar making, and that is the Monterey cypress. Though there are small native groves at Point Lobos and Pebble Beach near Monterey, most of the tree stands around the state have been planted for landscaping purposes. We see a lot of old trees on military land, in parks and cemeteries, and around farm lands, lining roads or fields, I guess to serve as wind breaks. At Hill guitar we use cypress for flamenco guitars, and also as the inner material of the laminated sides on the Signature Model. I laminate the sides on the Signature for the added stability and for the added aroma. It's extra work and materials, but I think it does something good for the instrument. Some other guitar makers such as Daniel Friedrich, Robert Ruck, and Jose Ramirez laminate sides on some models. I don't know why they do it, I've never asked them. So when we started running low on cypress I had to go looking for it. Years ago I had quite a bit of experience finding logs and milling guitar wood, but I haven't had to do it in a long time. I always have my eye out for trees falling down or being cut, so I started looking more carefully. I found that Steve Jackel had cut up some big trees in Watsonville, so Simon and I went out and went through his whole stack of cypress to get the good stuff. We picked out maybe 300 board feet, hauled it back to the shop and started milling it into sides and backs right away. This will be enough to last a long time. It's kind of messy work, but it's fun and makes the shop smell nice and spicy. We don't have to get it all done at once, we can put in a few hours now and then when there's free time. Monterey cypress is the one material we can get locally, but we still have to order everything else from other parts of the world. That's just the way it is. In the future we may make a line of guitars using more domestic or local woods, and this sort of pursuit becomes more important as the worldwide supplies of traditional materials become more scarce or controlled. Classical guitar has deep tradition running through it and consumers may not be quite ready to accept major changes in the look or the sound of the guitar from new materials. But searching for and cutting wood is interesting and satisfying, and cultivates such a more intimate connection with the materials, carrying on that lifelong love affair with wood. Get $1000 off this Hill guitar! A year ago Kenny Hill completed a custom performance model guitar designed for comfort and ease. This performance guitar had a stand up style tapered body, ergonomic arm rest, and 615mm string length. Kenny had built guitars as small as 630mm, and owned guitars even shorter, but generally those instruments have smaller bodies designed for children or smaller people. He pushed the “how-short-can-you-go” limit last year and found the 615mm scale concert guitar to be magical. This motivated him to build another guitar just like it. 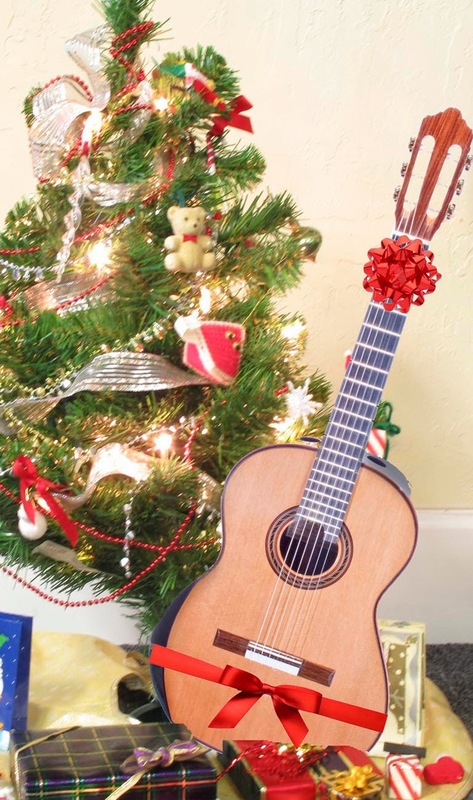 This custom guitar, usually priced at $6295, is on sale for $5295 this holiday season! If you are interested, or know a friend that may be interested, in purchasing this guitar, please call us at (800) 262-8858 or (831) 336-9317 or e-mail us at nkward@hillguitar.com.